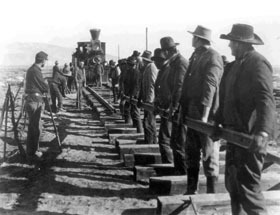 John Ford’s first epic western – a rousing drama of the construction of the first transcontinental railroad. With much of it filmed on location, Ford recreates the scale and scope of this mammoth enterprise, then barely 50 years in the past. The dramatic photography (seen to great effect in this tinted print), action sequences, and Irish humour will all be familiar from Ford’s later work.